Intuitive eating.... One of those tricky things which most people dont even really know what it means. They want some concrete plan... they follow what everyone else is eating or follow the latest diet, not sure how to eat or what is best to eat. But really, eating to maintain weight is quite simple - back to basics really. Eating a diet filled with lean protein, complex carbs, healthy fats, vegetables as well as getting your nutrients and minerals and also those special treats when your body and soul just need them. That is a balanced diet and a healthy diet. Though how much of what you should eat... that depends on the person and the persons needs. Listening to your body isnt easy for anyone. Most people have lost their trust in their body and their signals have become so messed up. But if we go back to basics... eating intuitively is listening to YOUR body. Not caring what or how others eat... someone offers you a cookie and you are neither hungry or craving it, then its fine to say no. You go out for lunch and realise you are super hungry so you order some dessert afterwards even though nobody else does... well good for you. You listened to your body. So the first step is to know when you are hungry and the second step is to know what it is you are craving. For me personally my body tells me what im craving mostly... need more carbs then i crave raisins and granola and crisp bread. Need more fat, then its egg yolks and handfuls of nuts... and well, i get enough protein as it is but there are times i dont eat so much protein and then i crave chicken like crazy! So my body is quite fine tuned when it comes to knowing what my body wants. And then the hard step of ... how much to eat. People like control, they want to know that they can eat X amount. They want to be sure and certain.... but the body is not a calculator. Its not like you eat 100kcal more one day and suddenly your body will gain 2kg. Its a gradual process, thats how weightless and weight gain works. Its not just a one time thing. So eating that pizza or eating less one day, that doesnt automatically mean weight gain/loss. Listening to your bodies signals and knowing when you are hungry and when you are full is what intuitive eating is. If you are full you stop, if you are hungry you eat. Though when you are sick your signals become very messed up and you can either eat too much or too little so it can help to follow a meal plan and then gradually begin moving towards more free eating. I.e you want that sandwich for a snack instead of oatmeal, then eat that instead... you want an apple instead of a banana, then eat that. You want cookies and milk instead of quark and nuts... then go for the cookies or vice versa. Knowing what your body needs and wants. 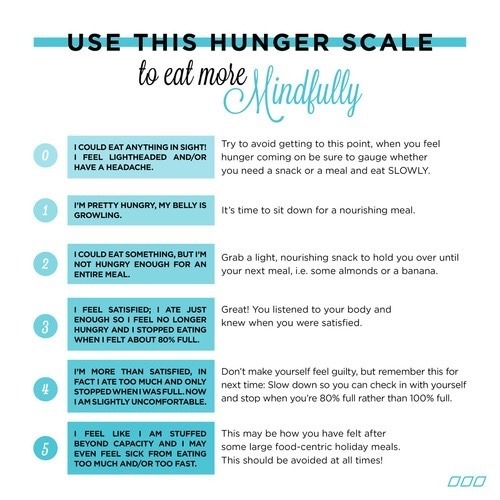 How long did it take you to get hunger cues for your meals when you were in recovery? I ask because I still don`t feel any hunger for my meals and was wondering how long it will take before I do and why it isn't happening yet. The only hunger cue I get is for my am snack, I don`t feel anything when it comes to actual mealtimes. I don`t have huge snacks so its not a case of filling up on those. Any ideas? It makes mealtimes difficult because I really don`t feel like eating.